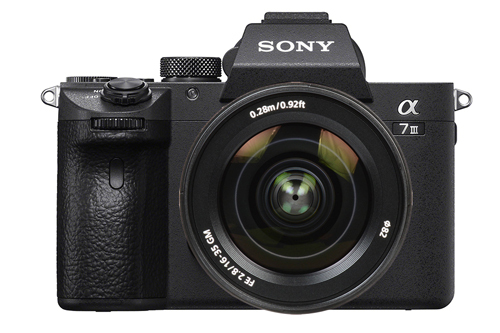 Sony announces its latest 24.2MP full-frame CSC, the A7 III. Sony's latest full-frame mirrorless features a 24.2MP BSI sensor, and 693-point phase detect AF. Having made massive in-roads with the wildly popular A7R III and "DSLR killer" A9, Sony has announced its third full-frame mirrorless in the last year. This 24.2MP Backside illuminated CSC pairs the best features of both cameras into a brand new package, boasting Sony's astounding AF algorithm, native ISO of 100-51,200 and a colossal 710 shot battery life. You can pick yours up for the relatively budget price of £2000/€2300, body only, from the end of March. Sony’s unmatched innovation within the image sensor space is at the forefront of the new α7 III, as it features a brand new 24.2MP[i] back-illuminated Exmor R CMOS image sensor with increased sensitivity, outstanding resolution and an impressive 15 stops[ii] of dynamic range at low sensitivities. By combining this sensor with a variety of impressive features, including extreme AF coverage of 93%, fast shooting at up to 10 fps[iii] with either mechanical shutter or silent shooting[iv], diverse 4K[vi] video capabilities and more, Sony has created a new tool that gives all types of creators – from enthusiast to professional – the ability to capture content in new and different ways than they ever have before. The newly developed 24.2MP[i] back-illuminated Exmor R CMOS image sensor is paired with a front-end LSI that effectively doubles the readout speed of the image sensor, as well as an updated BIONZ X™ processing-engine that boosts processing speed by approximately 1.8 times compared to the α7 II. These powerful components work together to allow the camera to shoot at faster speeds while also enabling its impressive ISO range of 100 - 51200 (expandable to ISO 50 – 204800 for still images) and an overall 1.5-stop[ix] improvement in image quality. The camera also features a massive 15-stop[ii] dynamic range at low sensitivity settings, ensuring outstanding overall performance at all settings and in all shooting conditions, with significant advancements in accurate colour reproductions of skin tones and the vibrant colours of nature. This new full-frame model can also output 14 bit RAW format[x] even in silent and continuous shooting modes, and is equipped with a 5-axis optical image stabilisation system that results in a 5.0 step[v] shutter speed advantage. The acclaimed Eye AF feature is also available in the new camera, even in AF-C mode, which is extremely useful for situations where the subject is turning around, looking down or otherwise obstructed. It also works when the α7 III is being used with Sony’s A-mount lenses with an optional LA-EA3 adaptor[xi]. Additional improvements in focusing flexibility include the addition of a multi-selector or ‘joystick’ for moving focusing points quickly, the addition of touch focusing capability, AF availability in Focus Magnifier mode, an ‘AF On’ button and much more. The new α7 III is equipped with an updated image processing system that allows it to shoot full resolution images at up to 10 fps[iii] with continuous, accurate AF/AE tracking for up to 177 Standard JPEG images, 89 compressed RAW images or 40 uncompressed RAW images[xii]. This high speed mode is available with either a mechanical shutter or the completely silent shooting mode[iv], adding to the immense flexibility of the camera. The α7 III can also shoot continuously at up to 8 fps[iii] in live view mode with minimal lag in the viewfinder or LCD screen. Additionally, if there is fluorescent or artificial lighting present in a shooting environment, users can activate the Anti-flicker[xiii] function to allow the α7 III to automatically detect frequency of the lighting and time the shutter to minimise its effect on images being captured. This minimises any exposure or colour anomalies that can sometimes occur at the top and bottom of images shot at high shutter speeds. The new α7 III is an outstanding video camera as well, offering 4K[vi] (3840x2160 pixels) video recording across the full width of the full-frame image sensor. In video mode, the camera uses full pixel readout, without pixel binning, to collect approximately 2.4x[xiv] the amount of data required for 4K movies, and then oversamples it to produce high quality 4K footage with exceptional detail and depth. An HLG (Hybrid Log-Gamma)[xv] picture profile is available on the α7 III as well, which supports an Instant HDR workflow, allowing HDR (HLG) compatible TV’s to playback beautiful, true-to-life 4K HDR imagery. Further, both S-Log2 and S-Log3 are available for increased colour grading flexibility, as well as Zebra functionality, Gamma Display assist and proxy recording. The camera can also record Full HD at 120 fps at up to 100 Mbps[vi], allowing footage to be reviewed and eventually edited into 4x or 5x slow motion video files in Full HD resolution with AF tracking. Sony’s newest full-frame camera is equipped with a variety of enhanced capabilities that were first implemented in the α9 and then again in the α7R III. These include dual media slots, with support in one slot for UHS-II type SD memory cards. Users have a variety of options for storing their content in each of the cards, including separate JPEG / RAW recording, separate still image / movie recording, relay recording and more. Battery life has been greatly extended as well – with a CIPA measurement of up to 710 shots per charge[viii], it offers the world’s longest[vii] battery life of any Mirrorless camera, as the new camera utilises Sony’s Z series battery NP-FZ100 that offers approximately 2.2 times the capacity of the W series battery NP-FW50 utilised in the α7 II. The α7 III features high-resolution, high-contrast, fast-start XGA OLED Tru-Finder™ with approximately 2.3 million dots for extremely accurate, true-to-life detail reproduction. “Standard” or “High” display quality settings are also available for both the viewfinder and monitor as well. It is also capable of seamlessly transferring files to a smartphone, tablet, computer or FTP server via Wi-Fi®, while also offering a SuperSpeed (USB 3.1 Gen 1) USB Type-C™ Terminal for increased flexibility in power supply and faster image transfer speed during tethered shooting. The α7 III model also comes with Sony’s new software suite “Imaging Edge”, which extends the creative capabilities of the entire shooting process – from pre-processing to post-processing. “Imaging Edge” provides three PC applications called ‘Remote’, ‘Viewer’ and ‘Edit’, available for free download, which support live-view PC remote shooting and RAW development. In the latest Version 1.1, several improvements have been implemented including about 10%[xvii] faster data transfer speed for remote shooting from PC (PC tether shooting) and approximately 65%[xviii] improvement in the response speed for RAW image editing. For more information, please visit Imaging Edge support page. www.sony.net/disoft/d/. The camera is also compatible with a wide variety of Sony E-mount accessories including the BC-QZ1 Battery Charger[xix] and VG-C3EM Vertical Grip. The new α7 III will ship in Europe in March 2018, priced at approximately £2,000 / €2,300 (body only) or £2,200/ €2,500 in a kit with the SEL2870 lens.